City fights for Carter Hotel, but is it a battle with ulterior motives? The Carter Hotel seen in a 2012 Google Maps image. NOTE: Originally Published February, 2013. 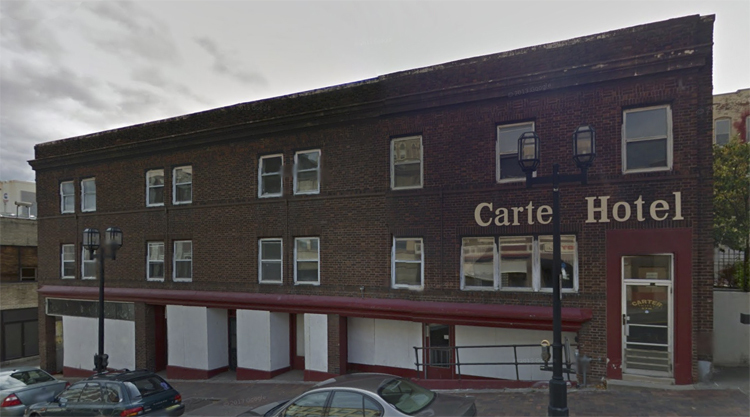 Duluth learned this past week the possible fate of the Carter Hotel, which is owned by the Fond du Lac Band. The band wants to demolish the structure to create more surface parking. Alison Lutterman, a Duluth city attorney, is against the building’s demolition, and that’s encouraging. The Carter is a contributing building to the Duluth COmmercial Historic District, which is on the National Register of Historic Places. Because of the building’s status, the burden of proof is placed on its owner to justify its demolition. According to the State Historic Preservation Office, the band must “demonstrate that the building is beyond salvation and there is no feasible economic alternative” to demolition. A letter by Lutterman to the Bureau of Indian Affairs suggests the band has been a very poor steward of the Carter since it purchased the building. The band’s neglect has created current conditions, Lutterman wrote. Perhaps this was by design. “Demolition by neglect” is an age-old practice of getting around preservation laws in order to demolish perfectly sound buildings. One common method is to introduce water and heat to a structure to promote the growth of mold, rendering it uninhabitable. The band, backed by a statement from the Bureau of Indian Affairs, is citing a damaged roof and rampant mold as reasons the building cannot be repurposed and therefore must come down. But when the band purchased the building in 2010, its roof was only 13 years old and sound, and a Minnesota Department of Health inspection showed no water issues or mold problems. Isolated, the old hotel wouldn’t have much of an argument to save it from the wrecking ball. But its place on the national register as a contributing building to the Downtown Historic District significantly alters the building’s importance. Since the historic district was established, Duluth has seen a great deal of investment in its historic building stock as more and more Duluth business owners realize the value of heritage tourism. The Zeppa Foundation repurposed two old buildings in the district as the Teatro Zuccone/Zinema and Zeitgeist Arts Café. The Fannie Rose building, originally the Grant Hotel and long-time home to the Original Coney Island [now Martha’s Daughter], has been renovated and includes a brand new business, Duluth Coffee. The historic 1889 City Hall has been completely renovated and is now Tycoon’s Zenith Alehouse, with Duluth history dominating its decor. Tycoon’s owners also are readying themselves for a renovation of the Interstate Auto Company [vacant; most recently Carlson Books]. Greysolon Plaza—the former Hotel Duluth—had its ballroom and Moorish Room renovated by owners Sherman & Associates, which also is preparing to renovate the historic NorShor Theatre. Those behind the renovations of these properties are making significant investments in Duluth’s heritage. Their efforts to create vital businesses that employee local citizens and at the same time retain historic building stock does more than save old buildings. It helps revitalize a portion of Duluth’s downtown that has struggled since most retail establishments moved above Skyline Parkway in the 1970s. Demolishing any one of the contributing buildings in the Downtown Historic District threatens these investments and harms local business. If we keep tearing down contributing buildings, there will be significant holes in the district’s fabric. The fewer historic buildings left standing, the weaker the significance of the district, and the less of a destination it will be—which is about the opposite of what the city needs to revitalize its downtown. When you consider that the growing industry of heritage tourism relies on having significant historic building stock, it is in the best interests of the Chamber of Commerce, Visit Duluth, the Greater Downtown Council, and every downtown business that we retain as much of the historic district as we can. In fact, the band would be better served by keeping the Carter standing. The casino itself is in a repurposed historic building, the 1929 Sears building: The band already is invested in Duluth’s heritage. The band says the Carter needs to go to create surface parking, but it didn’t seem to need more parking when it managed the adjoining, city-owned parking ramp. This action seems directed more by spite than necessity. The building could serve the band in any of a number of ways, many of which Lutterman already suggested. Lutterman’s view that the Carter should remain standing is somewhat of a reversal from earlier actions by the city. In 2007 the city allowed A&L Development to demolish the Costello Block at 22-24 E. Superior St. The Costello was also a contributing building to the historic district and was in sound condition; but the city allowed its demolition anyway. It will be interesting to see how the city views threatened buildings in the future when the city is not embroiled in a controversial legal battle with the buildings’ owners, as is currently the situation with the Fond du Lac Band. There has been talk of demolishing up to four buildings on the lower 100 block of East Superior Street, possibly including the Astoria Hotel (now Old Town Antiques, Bullseye Silkscreen, and the Chinese Dragon restaurant), the Peterson’s Buffet (now the Lake Place building), the Delray Hotel [at the time of this writing, the Delray was home to the Last Place on Earth; it is now Blacklist Brewing], and the Service Motor Company (now the Shel-Don Reproduction Center). The point of the demolition would have been to remove problems caused by customers of the Last Place on Earth, but that seems doomed to fail: Last Place owner Jim Carlson already has promised that if removed, he would find another place in Duluth to set up shop. So the talked-about demolition would be the ultimate case of throwing the baby out with the bathwater, as it wouldn’t just temporarily remove Carlson’s questionable business, it would potentially dislocate up yo five other established businesses. Fortunately, the idea seems to have died. But if it is resurrected—or in the future other buildings in the historic district are threatened—let’s hope the city attorney’s office argues just as vehemently to make sure they remain as it has in its fight for the Carter Hotel. The investments of countless business owners—and a growing number of jobs—depend on keeping our Commercial Historic District intact.